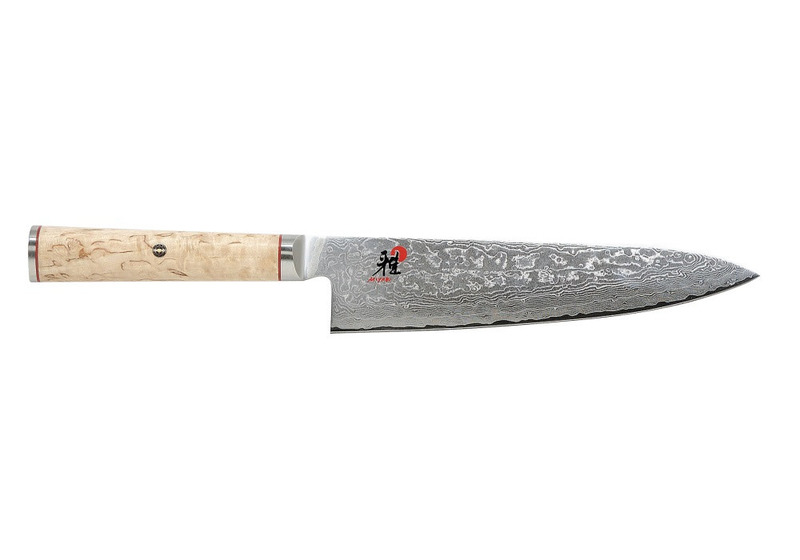 The 20 cm long GYUTOH from the MIYABI 5000MCD range is very impressive due to its relatively thin and yet stable blade with an authentic Japanese blade profile. The cutting edge is honed symmetrically at an angle of 19° providing the dual-edged Honbazuke blade with incredible sharpness, enabling you to accomplish even the finest work with ease. The blade consists of a MicroCarbide MC63 powder steel core embedded in 100 further layers of steel. This provides the basis for the distinctive Damask pattern which makes every knife in this range truly unique. The CRYODUR® blade is also ice-hardened at -196°C in a special process, which ensures a hardness of approx. 63 Rockwell. The D-shaped handle is a real eye-catcher while ensuring ease of use. It is made from beautiful Masur birch, keeping its style traditional. This wood is characterised by its unique pattern of changing lines and stripes. Thanks to its perfect balance, the handle ensures effortless and effective working, giving you maximum control while cutting. The GYUTOH from Miyabi is a knife of exceptional cutting strength.